It’s been a month or two since I discussed this last. “What are you up to?” you may ask, and I might shift my feet a little and not quite catch your eye when you say “You haven’t done anything have you?” which has a question mark but is not in fact a question. A few weeks after declaring myself “for hire” (wink) as a Dungeon Master, what exactly have I been up to? Most of my campaigns fall into one of two categories: they’re either there today and gone tomorrow, or they will go on for years, outliving the tolerance of the players therein. Time to create something confined to a few games, something that promotes return custom and also promises a satisfactory conclusion. The Wandering Pass closes every winter, leaving a handful of isolated villages and incautious travellers stranded high in the mountains. Food starts to dwindle, tensions run high, and somewhere out in the cold forests there waits a fate worse than death. Winter of the Wendigo draws inspiration from the likes of Dead of Winter, Grim Dawn, Until Dawn, 30 Days of Night, and probably a lot of other sources that have sunk so deeply into my subconscious library of ideas to pluck from that it may offer some unforeseeable twists for new and experienced players alike. It will be for 1st level characters to emphasise the fragility of their position, and it will be comprised of five episodes that can be played in sequence and stopped satisfactorily when a group decides they’ve seen enough… or until they’ve seen it through to the Spring thaw. Their actions, successes and failures will echo throughout the game in ways most video games can only hope to imitate. In addition, I’ll be expanding on one of my former one-shot campaigns – loosely entitled “Hangman” – into a three episode campaign of mistrust, deceit and subterfuge. I’m toying with a few new Mega-Dungeon concepts to bring to regular gaming sessions if I can secure repeat engagements with venues around the county, as well as throwing in some non-D&D games for those with a taste for something other than fantasy. So, in minor steps news the Facebook page for The Shropshire Dungeon Master has been started, albeit falteringly. Things that it will require – as a precursor to actual website construction – prices, contact details, a selection of what’s on offer games-wise, and a serious “looks” overhaul. As it stands it might as well just be a very thin version of my personal profile without the rambling “stream of anti-consciousness” that pours from my keyboard on occasion. Tim has rather kindly offered a logo design for me, and his ideas thusfar have been promising to say the least. If you live in the Shropshire area or nearby enough you can expect to see my grizzled features appearing in a gaming store near you to tout my services in the next few weeks, as well as a healthy plastering of the business across social media, aided by Tim’s own support of my endeavours. So while I can start this little undertaking without financial backing, there’s no two ways about it, I can think of ways and means that a bit of start-up capital would accelerate progress rather dramatically, and take me from someone optimistically going cap in hand around gaming shops asking to be paid to run role-plays to someone capable of presenting a professional front to what is essentially the next step up for a hobby. I have one last mutation to add and my starting line-up is complete. New trainers will be able to pick from Sporgoth, the slumped beast suffering a fungal infestation across its back, Katouche, a feline with a strangely artificial appearance, and Mudbait, an innocent looking amphibian with an odd taste for carrion. Leaking Information: Is It Bad For Business? In the last few days there has been a leak that shows us an early print of the upcoming Magic: the Gathering block Ixalan. 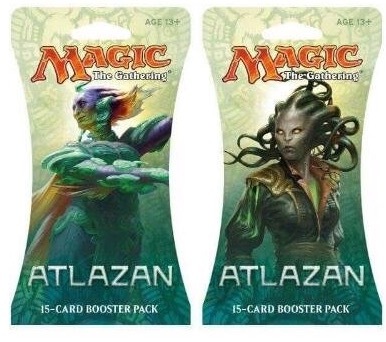 This is actually the second leak, but the first was barely a glimpse of the cover art which gives us some idea of the inspirations behind it, and listed with a different name “Atlazan”. Very minor compared to this huge release of info, a sheet of actual cards not due to be released for months. Understandably, Wizards of the Coast and Hasbro are not happy about this, but is a leak all that bad? For Wizards of the Coast a great deal of money, effort, and time goes into preparing their usual advertising campaign. This isn’t just the regular steady drip feeds of new cards through social media worldwide, but it also includes the short stories on their website written by teams of cannon artists developing the wonderfully deep narratives behind every block, and the normal promo events with Friday Night Magic prereleases. Read this piece by M;tG web content manger Trick Jarrett from the leaks around the Oath of the Gatewatch block two years ago about how such information leaks can undermine months, even years of work. For him it’s a personal kick in the teeth as it’s his work that’s being undermined. Through various associations with outside companies WotC expose themselves to the possibility of unauthorised leaks on a regular basis, but it’s still important to them to maintain creative control over the advertising process. It seems like a no-brainer, leaks happen because people want to know stuff! There’d be no need or call for leaked information if people weren’t interested, and there isn’t a company that doesn’t want anyone to be interested in their product. Should a company be keen to know that people are so determined to learn about their product that they’re willing to go around their planned release schedule? And by all means make a big deal about how you don’t want anyone to know about the information, but in many ways bemoaning the leak helps draw attention to it. You can frequently bring more attention with a leak and you’re own adverse reaction to it, than with your average run of advertising. Does Magic need the extra attention a leak might bring in for them? Not necessarily, but their advertisement can usually be formulaic. It can do some good to shake things up from time to time. Not that I’m accusing them of leaking their own cards, but maybe they needn’t be so downhearted. Let us not forget that this is not just a game of fun for some people, and that Magic is a game played at a competitive level, and it’s these people watching attentively at the leak sites to get a head start on the maths. That may sound a little over-the-top but there’s actual money in it for some people. And those players less involved who pursue the game’s news less rigorously lose out. In those particularly rare instances where leaks are more physical than just a photograph, some people can get hold of some early copies of cards long before release. These are the kinds of leaks that can truly damage a game and cause serious issues for the competitions that are integral to the gradual releases. Just a quick note on one of the finest examples of a film that could have never existed without leaked footage. Plenty of us have speculated on the possibility that Sony, probably Ryan Reynolds himself stole the test footage in an effort to make his little fan project a reality, and if that little flicker of perfection hadn’t hit the internet like an atom bomb we may have lost one of the best superhero films of the decade. Now, there’s no good comparison to make between a film and a CCG with regular releases, but it does go to show that leaks can have their benefits, and while they may wound the pride of the developers, ultimately they may find their efforts rewarded. Pros and cons aside let’s take a look at some of the content of the Ixalan sheet. It goes without saying that mechanically the cards are a solid mix of the usual chaff that will inevitably prove mildly useful or too specific for regular circulation, and the merciless and glorious horror cards that will have me – I mean, will have people buying booster after booster without a shred of remorse for their poor aching bank balance. I want to talk story and themes here. There’s a prevailing theme in the art contents, pirates and dinosaurs. There’s more to discuss but I feel that needs to sink in for a moment, pirates and dinosaurs. I’m also rather gratified to see that Ixalan’s giant reptiles are depicted with feathers. Early speculations included strong Atlantean and south American styles in the visual thematics, continuing in the ancient civilization themes, Greece, Mongolia, and Egypt, and with feathered reptiles we may see some Aztec deities or myths, perhaps a coatl like creature somewhere in the block. 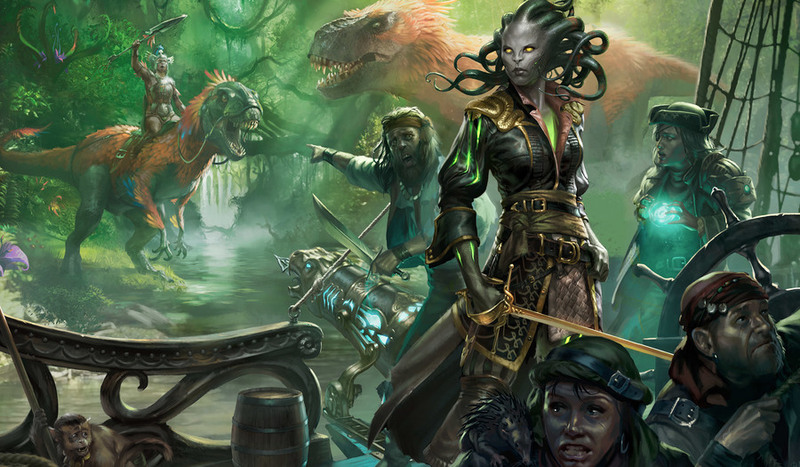 Finally we have our pivotal planeswalker, Vraska the Unseen, or whatever nickname she accrues. It’s going to be great to see a minor figure get some air time, although could the gorgon/assassin join the Gatewatch? I doubt it. That said I also doubt she’ll be the main threat to Jace and the Gatewatch. Whether the leak is for the better or the worse, this is going to be a cool set, and I’m really looking forward to the future of the game. Who says you can’t learn important skills for free? We’ve previously discussed MOOCs in the past, a free (or at least highly discounted,) way to learn new skills and gain certificates as proof of your completion. However, sometimes you’re less worried about the certification process and want to just learn an important skill. I’ve been reading around and found that HMRC give out for free. For today’s article, I thought I’d have a quick look at the concept of Gamification and open discussion to all of you about the subject. First and foremost, I am certainly not an expert on this subject, having only gotten some interest in the subject when I took it up on a MOOC course over on Coursera. The lecturer is certainly very credible, as he’s got his own book on the subject, which I would recommend getting as it’s a thoroughly interesting read. You can get his book, For The Win: How Game Thinking Can Revolutionize Your Business over on Amazon for just £4.31 for the Kindle book or £10.99 for the paperback. Gamification has given me a lot of food for thought, especially when it comes down to what I thought was standard business practice. It’s true, Joel and I have had many discussions about what we can do to make this GeekOut blog bigger and better. Whilst we ultimately will keep providing content, we’d love to implement some changes to the website, so I’ve been studying Gamification, as well as technologies.